Cleaning the flower beds this weekend and my husband happened to see a 13″ – 14″ Smooth Earth Snake (red, slender body) about a foot behind me. Just hanging around, you might say! Anyways I hope you enjoy a few signs of Spring around our place . . .
Coreopolis – wouldn’t be spring without these beauties! Thank you very much Prateek and glad you enjoyed the flowers. It IS lovely to see Spring taking hold Mary ! No raggedy wind blown petunias here even having seen the winter through . Amazing . So great to see you Poppy – hope you are well. Thank you and glad you enjoyed seeing a little TX Spring. Yeah, can you believe the Petunia’s and they are really going strong. I also have some other, looks like perennials, coming up in another container pot and have no clue what it is but I expect to see some kind of flower in the next couple of days. I think the birds are dropping seeds here and there. Hope you are enjoying your Spring and taking some wonderful photographs! I hope the snake is not poisonous! I love gardening but am not a huge fan of snakes! Hi Elizabeth – thanks. This snake isn’t poisonous – thanks goodness, right? The snakes around here are back underground. Bitter cold today. Hi Brenda, this snake is feeling at home as I’ve seen him several times recently – yesterday (right next to my hand as I reached down to pull weeds!). Hope your weather soon warms up. Eeek! They move in such in alien way that I’m always startled, afraid and then fascinated. Thanks Silver – actually the snake visited again last evening when gardening. He is an interesting character (a good thing he isn’t a copperhead, known to be in our area). Glad you enjoyed the shots! Yes can you believe it? Very cool and about 12 begonia’s are doing the same thing!! 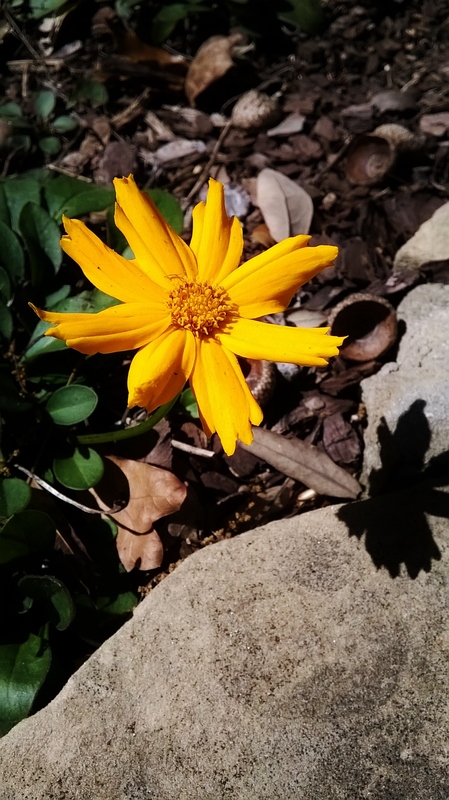 I’m having a good time this year with the flowers – part of my happiness is the local rabbit is nowhere to be found (think a hawk had his way) and that is helping many flowers take hold this year. Yes, here’s to spring! You brought it to us with you photos! Thanks so much Coastal and glad you enjoyed my little corner of Spring! Thanks and glad you enjoyed the pictures. Hi Maniparna, thanks very much – glad you enjoyed the spray of color! It surely is, Mary 🙂 Hope you have a wonderful Spring. Thanks Jo – Happy Spring to you my friend! Well, it snowed here yesterday, so seeing this was downright displeasing. Thanks Pauline – so sorry for sending a little Spring your way. I could send a tornado or two (as we are suppose to be having today – skies are darkening and it looks like the beginning of the storms are closing in). Oh, gosh no — I’ll take the pretty flowers! Buckle down and stay safe! Always so wonderful to see signs of spring. Thank you, Mary:) We have just come through a snap of cold weather for us….with a huge storm yesterday….however, today is sunnier and spring like weather is forecast. Ironically our flowers and shrubs have been blooming for weeks and weeks……Enjoy the day…janet. Hi Janet, thank you so much. Hope your flowers continue splashing your area with lots of awesome colors – has to be really inspirational for you!! Have a beautiful day. These are great photographs Mary. My favorite are the Purple Shamrocks. By any chance are they related to the blue Forget-Me-Nots? Hi Joanna, thanks very much! 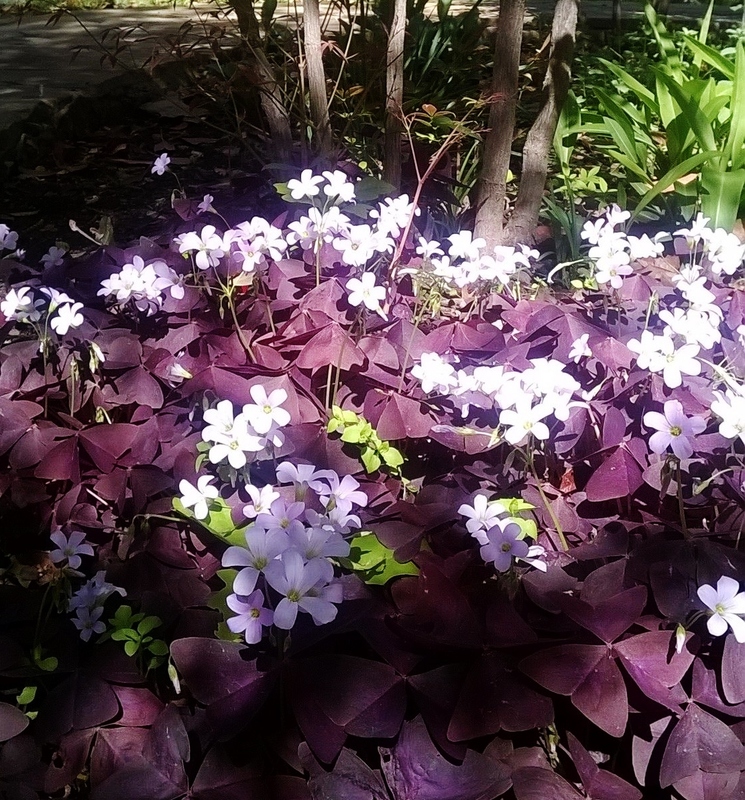 I really don’t know too much about the Purple Shamrocks, except they are tubular instead of roots which has made it easy to break the tubes and transplant them in many places in our yard. I love these little hardy guys, they have come up for the last eight years. Thanks Amy – our flowers are surprising us this year. Very happy to finally see a nice flush of color this Spring. We’re just starting to get our spring flowers in now, Mary, but we aren’t comparing to your glorious colours yet! Gorgeous! Beautiful colors! We are not even close, but we are moving forward… Right now we have daffodils blooming. What a lovely springtime post, Mary. And I love the rich color of the petunias. Thank you so much Jet. 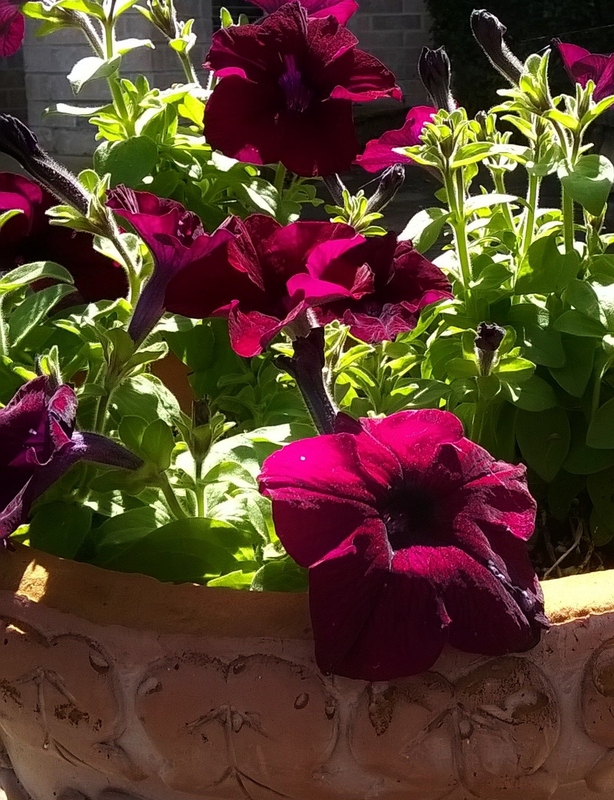 I couldn’t believe that the Petunias never died off and the color is really rich in person – glad you enjoyed! Spring and colors are coming ! Thanks Robert – even if you do love winter!! Thank you Holly, only my cell phone could have done this, that and morning light and shadows, lol! Thanks again and glad you enjoyed a little Spring color. I was in Washington over the weekend for Spring colors. Shall share a post on that later! Awesome Alok, can’t wait to see the gorgeous shots that you no doubt got. Thank you, Mary, they’re gorgeous! There’s no flowers here,yet, so it’s much appreciated. They are so on their way to you Resa – just you wait, the cold will melt away and colors of all sorts will be bursting forth. Beautiful Mary! Such a deep red. Thanks Nicodemas!! The colors are beautiful, aren’t they? Hi Sylvia, thanks very much! Can you believe it? My husband came around the corner and said whoa, look at that – I had no clue that he was around. You are so right, wouldn’t have wanted him crawling on my foot, then I would have screamed. Hi Rita, thanks very much – just love this time of year. I found the name on a tag in the garage called, Verbena. So pretty we planted them last year – they were pretty the first year. But this year, wow real showstoppers. Hi Nia – so nice to see you. Thank you very much and Happy Spring to you – glad you enjoyed the colors!! So glad you are enjoying the flowers of the season, Mary. (Maybe Prospero would know the botanical name you forgot 🙂 Happy Spring! Glad you enjoyed the flowers Cynthia. I might have the tag in the garage and will check. If so, I’ll post the name – we have purple ones of this variety too. Just love them. 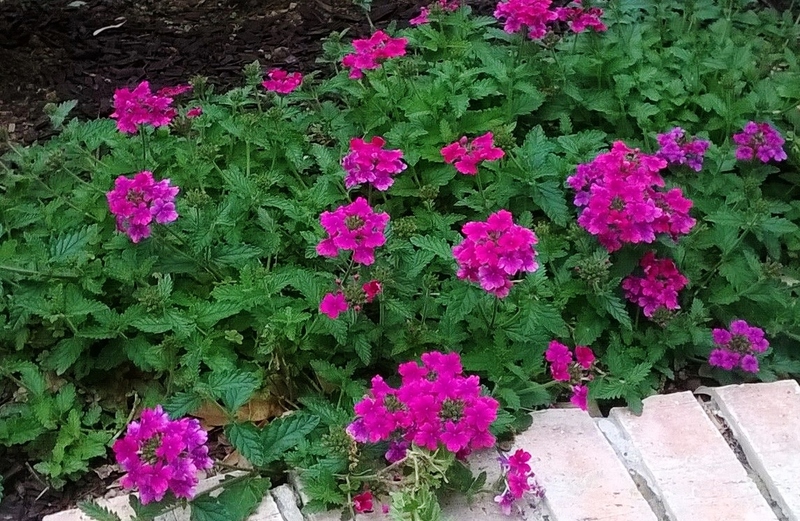 Hi Cynthia, I found the tag that goes with these flowers – I believe they are called, Verbena. This year they are flush with flower bud heads and started to open last week – they look fantastic. The light purple ones are wonderful too. 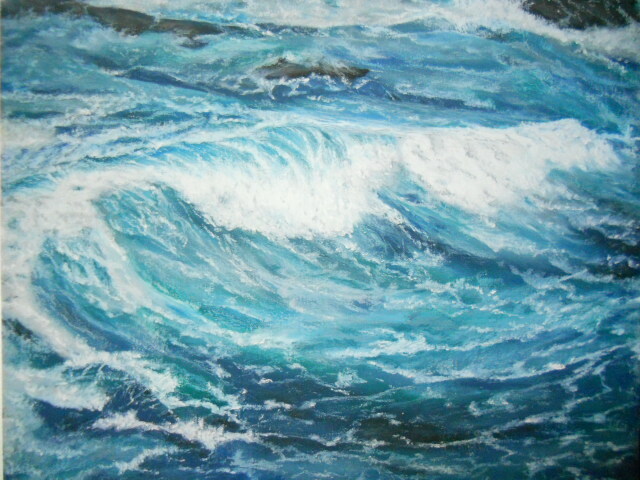 Your photographs are as lovely as your paintings, Mary. Beautiful colors! Thank you Jill – have a wonderful week ahead.